Jul 30, 2013 • In June, air pollution over Singapore and Malaysia spiked as forests in neighboring Sumatra (Indonesia) burned. Using NASA’s daily fire alerts and official national maps, the fires were located in the vicinity of oil palm and acacia tree plantations. However, the coarse resolution of the fire alerts coupled with outdated national maps, made it hard to establish culpability. So, in mid-July when a meeting was held among ministers of Indonesia and surrounding countries on how to curb pollution, the need for accurate land use and fire extent maps was emphasized. Recently, the Center for International Forestry Research (CIFOR) demonstrated that Landsat 8 data can be used to show fire-affected areas and land-use type. Using spectral information to differentiate oil palm from acacia (a tree used for pulpwood) plantations and visual information to determine land parcel ownership (small/medium land owners with irregularly shaped fields of varying sizes vs. plantations with large regularly shaped rectilinear fields). 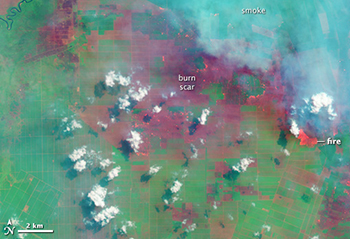 With a pre-fire image collected on April 22, 2013 and a post-fire image from June 25, 2013, CIFOR discovered that in the region studied industrial plantations accounted for over a fifth of the burned areas and only 4 percent of the burned land occurred in natural forests. This entry is filed under Agriculture, Carbon and Climate, Disasters, Fire, Forest Management, Human Health, News.